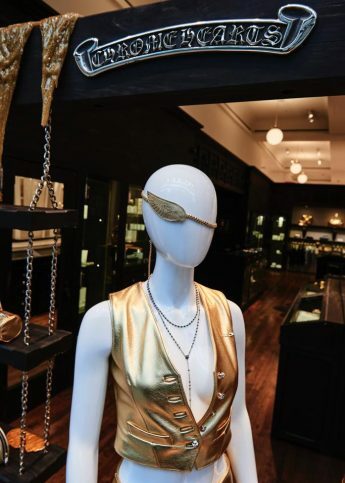 Thanks to a personal kinship and a mutual love for artistry and craftsmanship, Gareth and Chrome Heart creators Laurie Lynn Stark and her husband Richard have together created a 14 piece collection, all black with floor length skirts and a bustier made of all silver and accompanying accessories such as a pair of boots with a silver dagger for the heel. Its been suggested that this wont be the first collection from Pugh and Chrome Heart. The debut collection will feature at the Chrome Heart newly expanded shop-in-shop in The Wonder Room, Selfridges today. Chrome Hearts have paid homage to Pat McGrath with a brand new collection.